Yelle Share The Dish on Katy Perry, Drew Barrymore, Dr Luke and more! In anticipation for their two-day concert in Singapore (for the first time ever! ), electropop stars, YELLE, share more about their music, what it was like meeting Drew Barrymore, and performing in Singapore! Check out their performance on 12th & 13th May 2017 at the National Museum of Singapore. We hope you’re as excited as we are! First off, are you excited for your first concert in Singapore? We are very excited! We never travelle, let alone played here. We’ve only passed through the airport while we on tour in Australia. So yes, verrrrry excited! Your music is very interconnected to fashion and art, tell us more about that. When we started Yelle, we were very lucky to be immediately put in touch with some amazing people like, Jean-Charles de Castelbajac, Jean-Paul Lespagnard, and Brain Lichtenberg. The connections formed were instant, everyone had the same vision and pop sensibility that connected us naturally. Your performances are highly visual and multi-sensory. How do you get inspiration for your psychadelic performances? I don’t think it’s so much about inspirations actually… it’s more about being connected to our music to the maximum, and having everything link together. Spontaneity is our favorite way of doing things. We would like things to flow naturally with our creative process. Would you say that your music aims to provide commentary on the current sociopolitical landscape in the world? Our last song “Interpassion” is clearly an echo to the current society. We wanted to express love in a geopolitical way, with fun – We call it geo-pop-litic! What do you feel about the progression of the electronic music scene. How have you managed to stay true to yourself amidst that. The electronic music scene changes so quickly now, and there are so many genres and producers… basically every kid with a computer can produce electronic music. It makes it fun but also hard to follow. We never wanted to be part of a kind, of a scene, of a crew, we just do what we have in mind and release it. Our music, our way. Tell us more about your latest single interpassion? Where did your inspiration come from? Touring all over the world, meeting many cultures and feeling love everywhere, contrasting with all the hate you see on news, etc. Some people don’t have the luck to open their minds to other people and to get curious. That’s the main basis of how we made interpassion. The age old question, when will you be producing a new album? What can Singapore music lovers expect at your upcoming concert? Any surprises up your sleeves? The surprise is that we play in Singapore for the first time!!! Dr Luke produced Completement Fou with you, how did this collaboration start and how was it like to be working with a super famous pop producer? He discovered us through a remix that Katy Perry asked us to do. Then he came to see us on stage in LA and liked the show a lot! Soon, we ended up chatting to him on Skype. We weren’t sure what to expect and didn’t really know who he was either, at that time. We did however, know that we discovered a very talented man. He invited us to LA and we did a music session with him and some producers from his crew. It was a great session with a roomful of very good and talented people. Everyone was very passionate about the music and it allowed us to do our thing with the help of these amazing producers. You spent a long time promoting your music in the US. How did the US audience welcome you, and what is the funniest moment that happened to you during the tour? US is our main scene. we did Coachella 3 times plus a few big tours all around the country. We have created a very strong link with our audience there. I can’t tell what is the funniest moment but there is one time Drew Barymore showed up in our dressing room at the end of our show in Austin. She was extremely excited to meet us, it was unreal!! Same when Jessica Alba asked us to take a photo with her! There are way more stories to tell from our tours, but it would be longggg. Are you still in touch with Katy Perry? Some tweets sometimes but otherwise, not really. 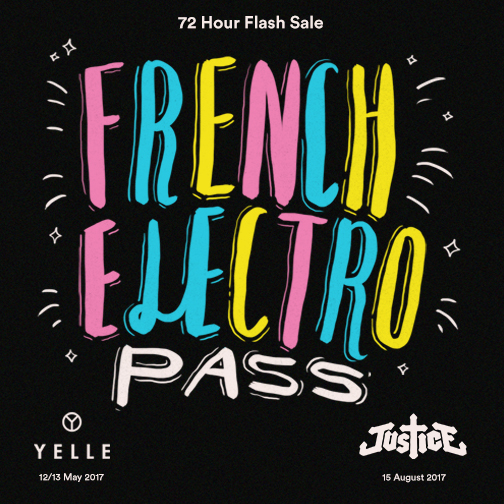 grab our special Combo Pass for Justice and Yelle* for just $139 (30% discount!) Available until 5pm on 13 May.